Ballymena United manager David Jeffrey. Picture: Press Eye. 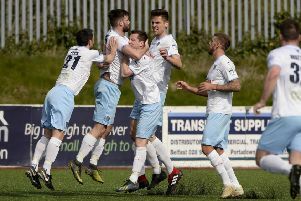 David Jeffrey will not waste any time in getting down to the business of rebuilding his Ballymena United squad. Barely has the dust settled on this season’s campaign before the Showgrounds boss will get stuck into the task of dismantling and adding to his panel. “That process has already started and obviously we have looked at several areas where we think could be strengthened. “There has got to be some reflection and analysis on our assessment but we have to sit down and make hard decisions - that will be pretty sharpish. “We have to look at which players are out of contract, which players we would like to re-engage and we also have to be clear on which players want to re-engage with us - there may be players who don’t want to be here, it’s not a one-way street. That will probably be done over the next week to 10 days. There are other issues with regard to the structure we need in place from the first team right down to the Academy and how we take the club forward. Jeffrey said he would speak to his Linfield counterpart David Healy at the start of next season, with a view to possibly bringing back winger Jonny Frazer on loan again next season. “It’s a wait and see situation. “We thank David and Linfield for the loan of Jonny and he played a significant part in our battle for survival,” added Jeffrey.